There are very few careers which don't require the ability to understand and interpret written information. Consequently, most employers who use psychometric tests in the selection process will include a verbal aptitude test. Verbal aptitude tests can be divided into speed tests, which don’t require much reasoning ability and power tests which do. 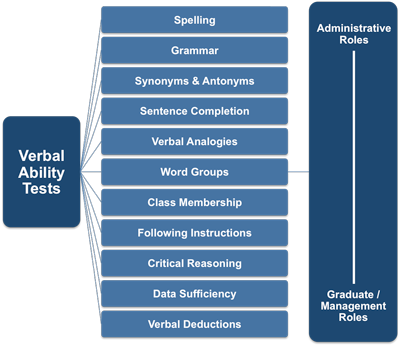 Tests of simple verbal ability, for example; spelling, grammar, synonyms and antonyms etc. usually consist of 30 to 40 questions which need to be completed in 15 to 20 minutes. Verbal reasoning tests on the other hand, take the form of passages of text that you need to read and then interpret in some way. These can be relatively straightforward comprehension exercises, or more complex statements where you will need to make notes about what you can deduce from each part of the text before attempting to answer the question. These are often referred to as verbal critical reasoning questions. In practice, the more straightforward types of question (spelling, grammar and instructions) tend to be more applicable to administrative roles and the reasoning and deduction type of questions are more applicable to graduate and management roles. Questions where you have to identify incorrectly spelt words are common in all levels of verbal ability tests. The test designer needs to choose words which are in regular use but which are often spelt incorrectly. These questions assess your ability to identify the relationship between words and to then apply this verbal analogy. To answer these questions you need to understand the meaning of the words in the question and establish what exactly the relationship is between them. These questions consist of a short passage of text and some related questions. Most people find that the best way to tackle these questions is to scan the text fairly quickly to get the general idea and then to attempt each question in turn, referring back to the appropriate part of the text. These questions are designed to test your ability to take a series of facts expressed in words and to understand and manipulate the information to solve a specific problem. These questions are usually restricted to graduate and management level tests.